Welcome to Fantasy Football Live Match Chat Gameweek 26. No double games to contend with this week, just a straight forward set of 10. 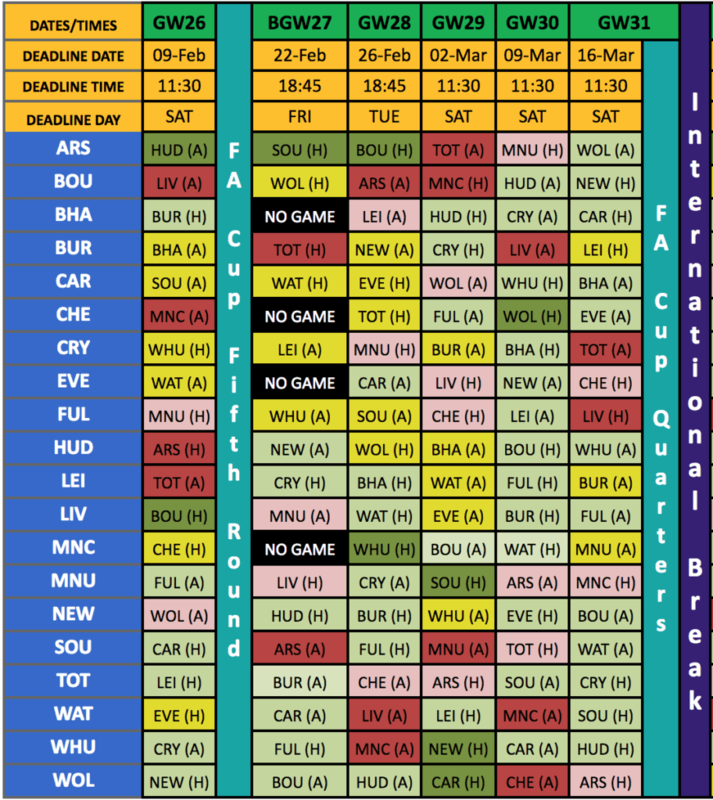 The last lot before we get rudely interrupted by the FA Cup again, but pay attention this time as what occurs in that may well impact hugely on what occurs in FPL later on with blank and double game-week ramifications all over the shop. Saturday begins with two teams enjoying contrasting fortunes since they recently changed their managers as Fulham host Man United. Saturday afternoon’s highlight, from a purely footballing perspective, will be watching Liverpool try not to choke completely against Bournemouth. Fail this test and we may as well just hand the title to City at 5pm. 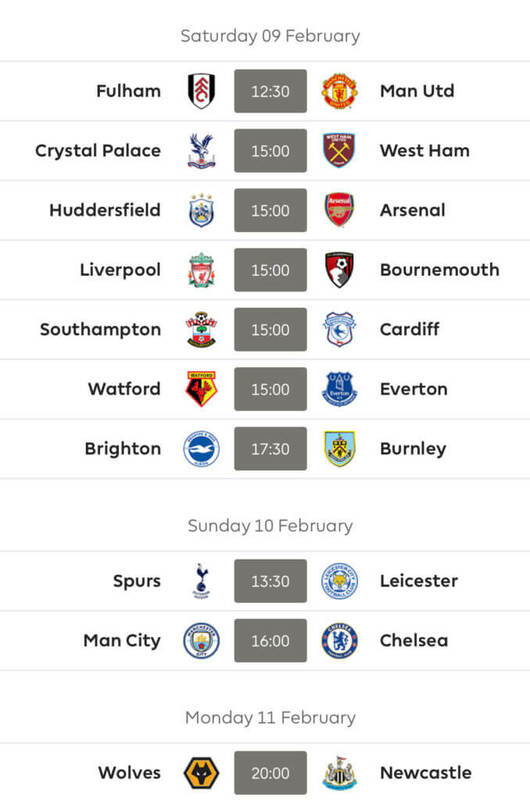 Elsewhere Palace and West Ham contest a derby, Huddersfield will continue their descent to the Championship against Arsenal, Saints and Cardiff have an almost literal six pointer and Watford will go all out to hang ex-boss Silva out to dry. 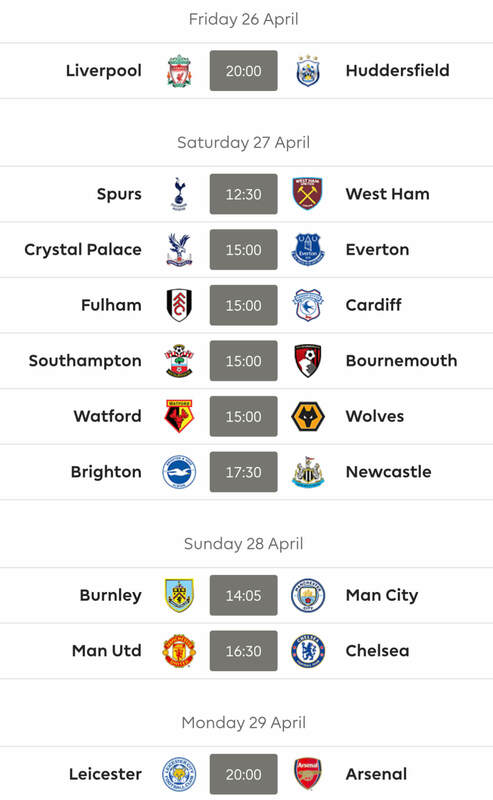 Sunday should hold more interest though, Spurs Lite and Leicester kick us off nicely at 1.30pm before the main attraction at 4pm as Sarri takes his Chelsea balls to Man City for a lesson in motivation. We continue into Monday this week as Wolves look to continue where they left off against Everton as Newcastle come to town, perhaps with a shiny new signing on show in the shape of Almiron. Good luck to absolutely everyone for Gameweek 26 from all at FF247! 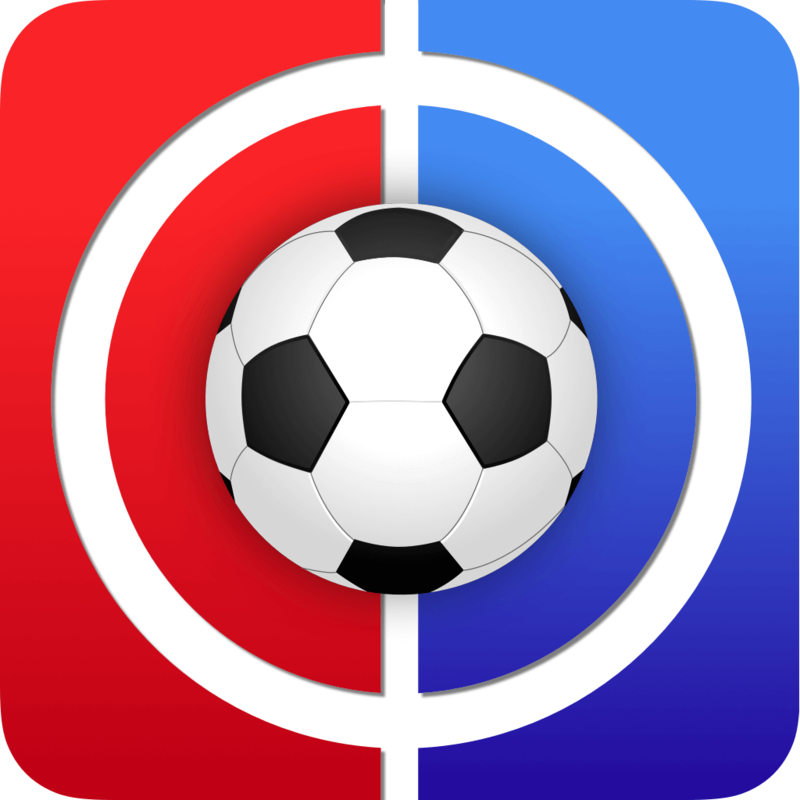 Thanks for reading Fantasy Football Live Match Chat Gameweek 26. Anyone else looking at Almiron vHUD for a crafty little differential?? How did he look last night when he came on? I didn’t catch the game after he did. Do need a cheap differential myself to enable Auba. Nothing relevant, but it wasn’t the game to such. He looked good on the ball, as expected, whenever it came to him and looked well positioned while off it. One to watch but yeah he may slot in directly in the XI given the quality he brings and the one lacking. Rosco could help here I suppose. Doubt it, he only saw what you saw and he won’t have seen him in MLS. I did, which is why I’m even considering him. Yeah I meant in terms of likelyhood to start and who would he replace. Didn’t see enough of the ball to make him worth punting on. There are better diffs out there. Thinking of Madison myself give Leicester’s fixtures. I’m starting to have a furtive look at some of the Leicester players. However an emotional reunion with Fraser is looking on the cards, for me at least. Fraser’s fixtures in 31 and 33 aren’t bad at all; Huddersfield in week 30 is an additional sweetener. This in the Richarlison replacement category, though of course Richarlison could play in 31. I would/will consider (re)buying Frasier when Wilson is back and firing as his absence has hampered the former’s returns. It may well be around those gws. However, it all comes very uncertain then with the blanks and doubles. How about Barnes of Leicester? Cheap as chips, seems nailed on and looks good on the ball and shows up in good shooting positions. He should’ve had one vs Spurs and he would’ve if their crack addicted GK hadn’t made that brutal save. Marvelous fixtures too till the end bar the last 3. I haven’t really given Leicester more than a passing glance so far. Vardy had occurred to me, that’s as far as I’d got. Thanks for the Barnes tip. At the moment I have three definite GW31 players – and one of them is Billing. So I need one more Liverpool player and then a few odds ‘n’ sods to make a magnificent 7, or hateful 8 or whatever. So Barnes could well come into play. Wolves being knocked out of the cup would be handy. But the second BGW of GW33 and chip play around that becomes important; whether or not to FH or WC in 32, and so on. The FH in 32 and building a side for 31/33 then wildcarding after 33 seems a goodish way to go. There’s a lot to overthink. Not for me (at the moment): Newcastle haven’t been the most free scoring of sides – only Huddersfield have scored less goals than them. Newcastle’s fixtures aren’t too bad, however, and they play in 31; if I were to head in their direction I’d be thinking Rondon, maybe. I thought the dude played – was subbed on? He came on in injury time first half. He might have picked up a knock in an incident with the linesman but managed to “play”. Honestly, that man has fallen so far from so high. Hoping for football’s sake, it’s just a bad spell in his career. I’m struggling to see how he can turn it around. Sure, changes of environment and style of play may help, but the guy has lost like eight yards of pace and all his burst. He just doesn’t look like he has the physical tools to compete any more, and it looks like he is all too aware of it as well. His confidence look shot to absolute pieces. My bet is on him going to MLS, China or the Middle East to wrap up his career. Thanks very much for the diary. It’s the best soap going. I love the mix of FL and Lady Gin. Will you have to see much of Lady Gin after you move? Hey mate, we will still see them as we’re just round the corner and LG can be useful with the girls during the day. Come witching hour though, we will not be anywhere near!! I didn’t realise you were ill, I’m sorry to hear this mate, what is it?